Great cities have their own personalities and in the company of Swiss writer Robert Walser, Berlin of the early twentieth century becomes a living, breathing entity, a dynamic metropolis drawing in the ambitious, the hopeful and the desperate in equal measure. As a guide to the city, its haunts, and its colourful inhabitants, he is endlessly engaging. His name has been surfacing in my consciousness for a while now, but I had not gotten more than a few stories into this collection before I wondered why it had taken me so long to “discover” him for myself. Berlin Stories from New York Review of Books is a collection of short stories composed during Walser’s years in Berlin and the first few years after he left, originally edited and organized by German Walser scholar, Jochen Greven. 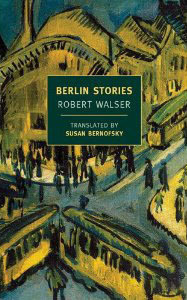 In her introduction to this edition, translator Susan Bernofsky tells us that, with the beginnings of a literary career underway, Robert Walser moved to Berlin in 1907 at the age of 27. His brother had already enjoyed success as a set designer in the thriving theatre scene. The city was bursting with life. Over the next six years he would record that life in short stories or “prose pieces” and three novels. But financial security eluded him and his own eccentricities did not help him secure the patronage that would have benefited him. He returned to Switzerland in 1913. The pieces in Berlin Stories are divided into four sections or “movements”: The City Streets, The Theatre, Berlin Life and Looking Back. Most of the pieces are quite short, often no more than a page or two. Narrators who may or may not be Walser himself, wander the streets, ride the trams, or take in theatrical performances while offering attentive discourses on the sights and experiences of city life. He can be thoughtful, melancholy, humourous or sarcastic, sometimes striking playful barbs at contemporaries. As with any collection of short works, especially one with 38 stories, it is hard to capture a sense of the volume in a brief review. There is so much magic in these pages, it is difficult not to marvel at the acuity of Walser’s observations. He is especially gifted at peering behind the glitz and creating moving accounts of what Bernofsky calls the “humbler aspects of city life”. He has an uncanny eye for the small details that play across the faces and animate the actions of the characters he sketches. Sometimes his observations are direct, at other times his intentions are delivered with a deft backhand as in “The Little Berliner” a story in which he takes the voice of a precocious 12 year-old girl, who enjoys a life of wealth and privilege. But all is not as wonderful as one might suspect. She reports that: “For reasons whose depths I cannot understand and consequently cannot evaluate, my parents live apart. Most of the time I live with Father.” She admonishes herself for confessing to her diary, but Father, for all his wealth and charm, is sometimes a very angry and unpleasant man. The observations and attitudes swirling around in her child’s head present a rather caustic view of the rich delievered in a wonderfully clever way. No one is injured in this instance but a distinguished old piece of architecture is lost, a fact greeted by one of the observers as a healthy form of natural selection, clearing out the dead wood and making room for new construction. I could go and quote from this work at length, there are little gems nestled in almost every piece. More than 100 years on, his work is vital, entertaining and immensely readable. At the height of his career he was a favourite of Kafka, Musil, Hesse and Walter Benjamin. The resonance of his voice has carried on through the influence of those who admired his work giving it the immediacy that feels so surprising when one first encounters him now. In his lifetime which was increasingly spent in mental asylums, Walser seemed to disappear off the radar. Greven’s German scholarship in the 1950s and the first English translation of his work not long before Walser’s death in 1956, brought him to the attention of a new generation of highly influential writers including WG Sebald, Peter Handke and JM Coetzee. Now, if you have yet to make the acquaintance of Robert Walser, hurry along and check him out. Personally I’m sold and can’t wait to read more. I’ve had this on the shelf for ages and your beautiful review had reminded me of its presence. Iove that quote from ‘Fire’ – it’s full of such vivid imagery. I was just swept up in this work – he is so much fun to read. I don’t know about German releases in this format but it was a German scholar who originally selected the stories and organized them. Bernofsky would probably know, she has translated a lot of his work. I hope you like him, he really is so much fun to read. I was surprised. I’ve seen a few of his books are available as NYRB books. He always gets rave reviews so I really should read some of his work. I’ve wanted to read more German lit. and this sounds like the perfect choice. And, of course, any NYRB pic is a great one! I can recommend this one highly. Very enjoyable. This one is definitely out in the UK. It’s not new and Nicholas Lezard has gushed about it at the Guardian several times over the past couple of years. That’s how I first heard about this collection. I think I’ve been going to the wrong bookshops … I’m not a great fan of Waterstones as a general rule, but there was a whole wall of NYRB publications at their Warren St store. I’ll certainly be looking out for it. I read Haffner’s ‘Blood Brothers’ earlier this year and realised that I really needed to read more early 20th century Berlin books! We have an indie store in town with an extensive nyrb selection but they display them spined by colour which looks lovely but makes browsing a challenge! Was Blood Brothers good? I saw that in South Africa of all places and made a mental note to look for it at home but forgot. I saw that happen when I was on holiday in NY; they’re beautiful books but can make your eyes swim when piled closely together. I’ve read Jakob von Gunten and one collection of short stories – I think the short fiction works better, but I’d be interested to hear your take on one of his novels. I was considering Jakob von Gunten but while I was at the bookstore to pick up a book I’d ordered I found another Berlin era novel The Tanners. It comes with an extensive introduction by WG Sebald complete with embedded photographs. I could not resist. It will have to wait in the TBR pile a bit but I am interested to see how a longer work compares. In Berlin Stories I preferred the longer pieces (though the longest is only 13 pages) but I liked it when he gave himself more room to work with. That is a good review. This has been on my radar for ages. I’ve no idea when I’ll next go to Berlin, but when (hopefully when not if) I do I’ll try to pack this in my case. I would love to visit Berlin someday. With Walser under your arm you will be set to play the modern day flaneur strolling the streets imagining the life of an earlier era! Excellent review! Robert Walser has always been one of the authors closest to my heart. As Elias Canetti has put it (I quote from memory): you cannot read him without feeling ashamed for all that ever seemed important to you. My favorite work by Walser is “Kleist in Thun”. I am now read his novel The Tanners and will post on it during German Literature Month. I look forward to your review of The Tanners. I also have that one (the WG Sebald introduction was a huge selling point). I am not certain if I will manage it for German lit month as my German lit goals are rapidly expanding. I may go for one of Walser’s novellas. I will see. Thank you for your comments. I will have a look at your blog later today.